Rooster glassware is perfect for a farm-to-table restaurant, chic venue, or homestyle diner. With a crystal clear clarity and farmhouse design logo, these glasses can showcase a vibrant cocktail or simply serve as hip water glasses. Our rooster glasses have increased durability, so whether you are filling them with soft drinks, fruit juices, or signature cocktails, they can withstand daily use. If your establishment wants to keep up with the trendy farm-fresh style, rooster glassware is an excellent option to add a rustic touch to your restaurant. If you own a coffee shop, rooster glassware can add a rural, personal touch to the water glasses at your self-service water stations. These glasses are also perfect for a farm-to-table wedding or outdoor event in place of more fragile drinkware or to go with a farm theme. While a rooster glass is great for water or juice, a variety of sizes and shapes enables them to function perfectly as cocktail glasses. Serve up an old fashioned in rooster glassware, or create an herbal cocktail to match the rural glass with local mint or lavender. 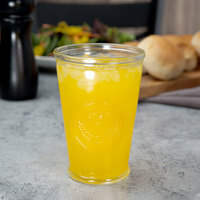 Whether own a farm-to-table eatery, contemporary bar, or modern restaurant, rooster glassware is ideal to serve your finest cocktails, soft drinks, and fruit juices. You can fill these glasses with beer, gin and tonics, water, orange juice, mojitos, and more. With crystal clear clarity, your guests will love the appealing presentation of their drinks in rooster glasses. An imprinted farmhouse design logo and classic shape embraces a trendy, home-style presentation that your guests will love. Rooster glassware boasts elegant, yet durable glasses with sturdy walls and a thick round rim. The robust glass construction ensures that these rooster glasses will last and become a staple at your establishment. With a high-quality form, your guests will enjoy the look and feel of this glass. Their versatility makes rooster glasses perfect to serve water, milk, juice, or cocktails, in a range of settings. Farmhouse rooster glassware is perfect for everything from home-style restaurants, farm-to-table eateries, hotels, and bars. If you are looking to spice up your glassware, rooster glasses are an excellent option for your eatery that serves farm-fresh food or that has farmhouse decor. These glasses can even be perfect for chic bars and venues that are looking for a more durable, long-lasting, hip option. Rooster glassware ensures that your drinks will appeal to guests because of their crystal clear composition. These glasses perfectly present ice-cold water, orange juice, cocktails, beer, and more. The versatility and durability of a rooster glass makes it an ideal product to have at hand. Fill these glasses with everything from cold brew coffee to whiskey sours at your cafe, catered event, bar, restaurant, diner, or hotel.